In this delicious zucchini lasagna, zucchini slices replace the noodles. This low carb, gluten free lasagna has all the wonderful flavors, minus the carbs! Zucchini slices replace the noodles in this low-carb, gluten-free zucchini lasagna. 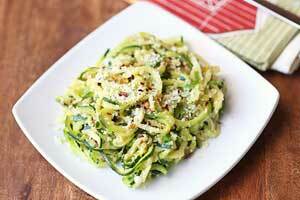 So you don’t just get rid of grains and refined carbs, you also enjoy the health properties of zucchini! Does zucchini lasagna taste like regular lasagna? Not exactly. And the texture is different too. But it’s an excellent low carb substitute. Zucchini slices don’t work as well as noodles in terms of keeping the lasagna’s shape, so this keto lasagna is flimsier than traditional lasagna. But in terms of flavor, it’s another victory to low carb cooking, and another proof that the starches in many recipes merely absorb other flavors. This zucchini lasagna tastes amazing. So good in fact that I don’t plan on making it too often, since I found myself having THREE, yes three big slices instead of the one I was planning to have. 😳 Yes, it is that good. By the way, another really good low carb lasagna is this low carb spinach lasagna. Why do you grill the zucchini slices? 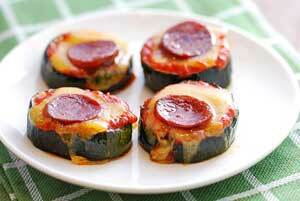 Zucchini is very watery, so do go through the extra step of grilling the zucchini slices before assembling the lasagna. Grilling will help dry them off and remove some of the water. Otherwise, they will release their water into the lasagna as it bakes. What sauce to use in this zucchini lasagna? Needless to say, the flavor of your lasagna will greatly depend on the marinara sauce you use. I always use sugar-free spaghetti sauce, and my favorite is Rao’s. It has a clean list of ingredients and the spicy Arrabbiata sauce is wonderful. Rao’s used to only be available at Whole Foods, but lately I’ve been seeing it in my supermarket too. Of course, just like everything else on earth, it’s also available on Amazon. How to serve this zucchini lasagna? This lasagna is a complete meal. So you don’t really need a side dish to go with it. But I sometimes add a green vegetable, such as steamed broccoli. Leftovers of this tasty zucchini lasagna keep well in the fridge, in an airtight container, for 2-3 days. Reheat them in the microwave, covered, on 50% power. You can also freeze leftovers. In this delicious zucchini lasagna, zucchini slices replace the noodles. This low carb, gluten free lasagna has all the wonderful flavors of lasagna, minus the carbs! Preheat oven to 350 degrees F. Slice the zucchini lengthwise, into 1/4-inch-thick strips, getting 6 slices out of each zucchini. Spray the zucchini slices with olive oil coking spray and sprinkle with 1/2 teaspoon salt, 1/8 teaspoon black pepper and 1/2 teaspoon garlic powder. Grill the slices, in batches, 2-3 minutes on each side, or until golden and firm - not browned and crisp. Spread on clean kitchen towels to soak up more moisture. In a large skillet, heat the olive oil over medium-high heat, about 3 minutes. Add the meat, the minced garlic, 1/2 teaspoon kosher salt and 1/4 teaspoon black pepper. Cook, stirring with a wooden spoon to break up the meat, until meat is browned, 5-7 minutes. Drain into a colander, then mix in a bowl with 1 cup marinara sauce. In another bowl, with a fork, mix together the ricotta, eggs, basil, and the remaining salt and pepper. Assemble the lasagna: Spread 1/3 cup of the marinara sauce on the bottom of a 9 X 13 baking dish; Top the marinara sauce with a layer of zucchini, then a third of the ricotta mixture, a third of the meat mixture, and a third of the mozzarella cheese; Repeat, arranging the zucchini slices in the opposite direction: zucchini, 1/3 ricotta, 1/3 meat mixture, 1/3 mozzarella; Repeat one last time, adding one extra layer of zucchini: zucchini, ricotta, meat mixture, more zucchini, and mozzarella. Bake, uncovered, until the cheese is golden, about 30 minutes. You can finish by broiling for 2 minutes on high to brown the cheese, if you wish.